This week’s Behind the Bride is with Anna, from Me, Annie Bee. Hi Anna, thanks for taking part. First of all, congratulations on your marriage! When was the big day? We first met in 2007, he was my friend’s boss. I saw and talked to him a few times on nights out, decided that I quite liked him and then did what any self respecting woman with a crush would do…avoided him. I eventually plucked up the courage (thank you wine) to send him a FB message asking if he wanted to go for a drink. We met up the following Friday and the rest, as they say, is history. Well, this is a bit of a sore point. Over the 10 years we’ve been together I’ve proposed (and been denied) MANY times. I resigned myself to the fact that I would be a girlfriend for the rest of my life. Then one evening in January, I said “Shall we get married in secret?” and we made a plan. I kept a diary from that day to the wedding day that can be found here. It couldn’t have been more perfect. We decided to get married in secret – us, the kids (Aoife 7 & Seth 3) and two friends as witnesses, but we still wanted ‘wedding’ things. I had a ‘proper’ dress, we had flowers and a photographer. Aoife went to school on the morning, I had arranged with her headteacher that we could pick her up after lunch. Then Rory took Seth trampolining (risky) while I started getting ready. Rory picked Aoife up and we told the kids we were getting married, they were shocked. 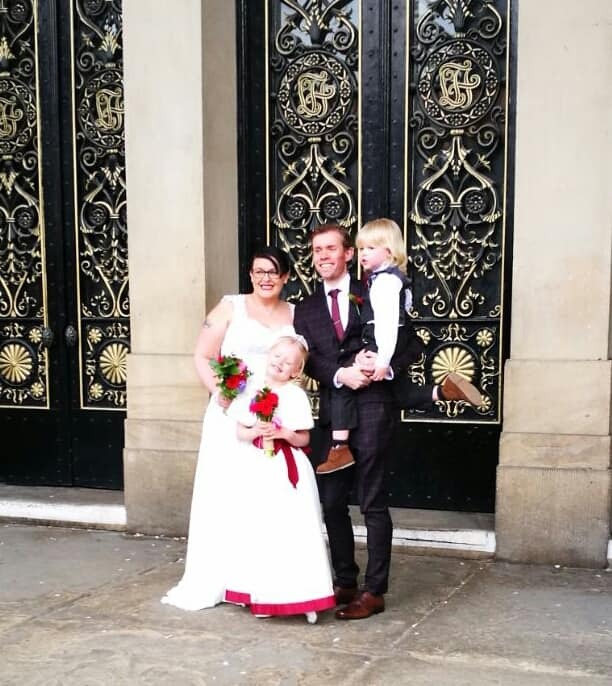 We got married at Leeds Town Hall, the staff there made it really special. They set out the chairs so we were all sat together and the kids passed us the rings. We had a bit of a red colour theme, Rory and Seth’s suits had a touch of red in, Aoife’s dress had a red sash, I had red shoes and the flowers had red in them. After we had the ceremony, we walked through Leeds with our AMAZING photographer and went on to this really lovely Italian restaurant. We were home by 9.30pm but it really was everything we wanted it to be. All of it! That’s lame isn’t it? But it really just defined us as a couple, us as a family in fact. I’ve actually been married before and had the ‘big’ wedding and I can hand on heart say this was better. It was more exciting and it was about us celebrating our love rather than deciding where drunk Uncle Jeff would sit. I’d have maybe worn a more comfortable shoe! Do what you want, do NOT please everyone else. It’s about you two as a couple, not anyone else. They’ve had their go/will have their go and if they love you they’ll appreciate your decisions. Also, don’t sweat the small stuff. Life is too short to fret about chair colours and napkins. No one will remember those bits of the day anyway. If you enjoyed hearing from Anna, you can visit her blog or catch up with her over on Facebook and Twitter. If you’d like to take part in the series, please email me to discuss.